What are alternative models of the dissertation? Why is an open, nontraditional dissertation format right for this project? of the nineteenth century help us to better understand about the institutions that shape our scholarship and pedagogy today? More pointedly, what can this period teach us about who we are leaving out of our classrooms and communities of thought? Like our own historical moment, the nineteenth century was rife with technological and social changes that affected how people composed and interacted with texts. What creative modes of expression and connection have the dominant reading practices of the past and present dismissed? Which of these practices highlight missed opportunities for us to connect with our students and our peers? What might it look like to experiment with new approaches? And, finally, which institutions or practices rise up to complicate these experiments? What does that tell us about the power structures we inhabit? described presentism as having “an awareness that our interest in the period is motivated by certain features of our own moment” (Manifesto of the V21 Collective). The word “awareness” highlights an ethical dimension inherent in this critical turn as well as in this project. Many strategic presentists believe that the New Critical and historicist methods that have predominated in years past disregard their dependence on Western value systems. This, in turn, limits our ability to critically engage with our field. We can see longstanding dependence on Western value systems at play in the ways the New Critics treated texts as objects that could be separated from the conditions under which they were composed, revised, circulated and later subjected to academic scrutiny. Scholars such as Priya Joshi, Rachel Ablow, Kate Flint, and Leah Price counter this attitude by highlighting the ways in which social and cultural contexts shape the way we read texts. Works by scholars of the long nineteenth century have been central to demonstrating that a purely formal analysis simply isn’t possible. Strategic presentists point out that there is a similar self-contradictory logic at play when people conduct historical research without registering that our archive is a mediated by multiple distorting lenses of privilege, a dynamic that many past historicisms have failed to acknowledge. Our understanding of the reading practices, lived experiences, and material texts that were common in the Victorian period is shaped by multiple gatekeeping structures that have compounded over time. When people make decisions about which texts to preserve in a library’s special collections or which poems to use as a case study in an article, they are inevitably responding to the categories and biases that structure their own present. Current literary criticism may have gained important methods and perspectives from some of the New Critics and historicists who strove for an impossible ‘purism’ in their approaches. (Among these positive legacies is the language we use to describe close reading practices and archival research methods!) However, we should be sensitive to the ideological traces that persist in the field because of its past elisions. And so, as Tanya Agothocleous urges, we should think of responsible presentist scholarship “not just as the use of present concerns as a lens on the past but as a stance that rejects specific visions of the future in favor of illuminating the persistence of the past in the present”—however unpleasant that persistence of the past in the present may be (93). In her own response, Anna Kornbluh registers the politically-charged conclusions that research into past institutional structures can compel us to express. Strategic presentism, Kornbluh says, “might mean active listening to the presentism of past fiction, its critical mediation of potential worlds, and re-sounding that presentism in our own moment, so that in the future, the past can embolden us to say what must be said, in the present tense, now” (100). Roughly, then, what goals can our presentist strategies advance? What can studying the long nineteenth century offer us beyond an arbitrary historical distance that facilitates present-day comparison and contrast? In the following pages, I argue that the most compelling reason to study the long nineteenth century is not the specific works published during that period of time, but rather, our current orientation toward the nineteenth-century archive. Put a different way: our current relationships to long-nineteenth-century texts—as well as to current-day patterns of technological change and global capitalism—make it possible for researchers and instructors to do more with Victorian media and to reflect differently on our own information ecosystems than many other archives permit. We have the tools to identify which voices our institutions are leaving out. What we need is to use these tools to resituate our own writing and teaching within those institutions. My stance is informed by work at the intersections of Victorian studies and two broad but overlapping branches of scholarship: Critical Information Studies and Open Pedagogy. Each of these branches is driven by a sense of exigency, and I think it would be well to outline each area’s pressing concerns before further unpacking my claim about what sets the Victorian archive apart. In later sections, I will refer to open pedagogy as the central educational philosophy that motivates my project. However, in this section, I include the related schools, “critical pedagogy” and “constructivist pedagogy.” My intention is to register that many existing projects in Victorian Studies and critical information studies are motivated by the same philosophies that inform open pedagogy but may not share open pedagogy’s beliefs about how to enact these philosophies. One thing that critical pedagogy shares with Critical Information Studies is the belief that knowledge distribution platforms and educational institutions play a major role in promoting or forstalling participation in the public sphere. Critical pedagogy focuses on the power structures at play in the classroom and asks how we can increase students’ agency as respected participants in learning communities. Practitioners differ in their opinions of how to confront educational power imbalances—and indeed, most consider this restless meta-reflexiveness to be a strength. However, as Jesse Stommel and Sean Michael Morris distill the concept, a general goal of many critical pedagogues is to see “vertical (or hierarchical) relationships give way to more playful ones in which students and teachers co-author together the parameters for their individual and collective learning” (An Urgency of Teachers). This approach views the classroom as a community in which group roles should be openly discussed and desired outcomes should be continually and collaboratively re-determined. Like critical pedagogy, constructivist pedagogy seeks to destabilize dominant assumptions about what constitutes knowledge and to value students’ individual learning processes. Indeed, these two philosophies have evolved in response to one another. The social constructivist branch of constructivist pedagogy approaches learning as a process of collaborative meaning-making that exists within a network of within-group dynamics, broader institutional structures, and other political systems (Kim 55-60, Richardson 1625). Social constructivists believe that knowledge is culturally negotiated and embrace student contributions to a knowledge community. However, some scholars have expressed concern about how social constructivist theories may still reflect the privileged belief systems within which its foundational theories emerged (Richardson 1635). Put a different way, even though social constructivists embrace the disruption of traditional power structures in the classroom, they may sometimes fail to understand how the modes of collaborative knowledge generation they seek to cultivate as a universal value can still reflect dominant Western ideals (Richardson 1635). By now, this critique may sound familiar: social constructivist pedagogy faces many of the same criticisms that the field of Victorian Studies faces. We can see some critical and social constructivist values woven together in the linked frameworks of Critical Information Literacy and metaliteracy. These two frameworks prioritize outward-looking contextual analysis and internal reflection as essential parts of the learning process. As Lua Gregory and Shana Higgins define the concept, critical information literacy “differs from standard definitions of information literacy (ex: the ability to find, use, and analyze information) in that it takes into consideration the social, political, economic, and corporate systems that have power and influence over information production, dissemination, access, and consumption” (Gregory and Higgins 4). This understanding of 21st-century competencies is reshaping many educators’ goals for their classroom. For example, Association of College and Research Libraries’ most recent (2016) update to their “Framework for Information Literacy for Higher Education” registers the importance of critical information literacy, although the framework itself doesn’t use this moniker. What the ACRL authors do emphasize is the need for learners to understand “how and why some individuals or groups of individuals may be underrepresented or systematically marginalized within the systems that produce and disseminate information,” to “recognize issues of access or lack of access to information sources,” and to “understand how the commodification of their personal information and online interactions affects the information they receive and the information they produce or disseminate online” (6). In addition to highlighting the situatedness of knowledge construction, the ACRL framework celebrates the concept of metaliteracy, noting that the term “offers a renewed vision of information literacy as an overarching set of abilities in which students are consumers and creators of information who can participate successfully in collaborative spaces. Metaliteracy demands behavioral, affective, cognitive, and metacognitive engagement with the information ecosystem” (2). Emphasizing the importance of critical information literacy for students, instructors, and researchers alike may help us reduce constructivism and literary studies’ tendency to prioritize dominant cultural epistemologies. In the broadest understanding of the term, open pedagogy explores how we can use, create, adapt, or share freely accessible teaching objects with our students and peers. Practitioners seek to understand the ways in which open content reshapes students and instructors’ orientations to their classrooms and communities. Open pedagogy embraces social constructivism’s belief that learning is a process of social meaning-making while maintaining critical pedagogy’s commitment to interrogating the roles we play in our communities of thought. However, open pedagogy differs from constructivist and critical pedagogies in some of the central ways that it enacts these commitments. As Rajiv Jhangiani defines the concept, open pedagogy is an “access-oriented commitment to learner-driven education” but “it is also the process of designing architectures and using tools for learning that enable students to shape the public knowledge commons of which they are a part” (“Open Educational Practices”). Open pedagogy teaches students that “knowledge consumption and knowledge creation are not separate but parallel processes, as knowledge is co-constructed, contextualized, cumulative, iterative, and recursive,” and it does so by inviting students into the process of knowledge construction and iteration as active and equal participants (DeRosa and Jhangiani). Ideally, an open pedagogy project explicitly welcomes future participation and adaptation (Robbins, “Guidelines”). What can this look like in practice? It may take the form of inviting students to use the classroom research process to correct gaps in Wikipedia’s representation of Native American authors, an assignment Sioban Senier outlines in “Indigenizing Wikipedia.” It may take the form of inviting students to collaboratively compose their own textbook, as Robin Derosa did with the Open Anthology of Earlier American Literature—a text which Abby Goode’s students and then Timothy Robbins’s students and other volunteers expanded in turn (DeRosa, Sheridan, Robbins). It may take the form of a decentralized discussion group in which people collaboratively annotate texts on the open web, something Remi Kalir facilitates on an ongoing basis through his “Marginal Syllabus” project. As its name suggests, open pedagogy is committed to an intentional openness, but this is not the same as saying that all information should be open. This distinction is one of the ways in which critical information studies research informs open pedagogy. Published knowledge can be exploited or misused, and one of the challenges shared by all of the “open” movements is to make careful decisions about the implications of different degrees of publicness. This consideration applies to shared content as well as to learning context. For example, Johanna Funk, Kathy Guthadjaka, and Gary Kong provide one example of this sensitivity in their reflections about whether Yolŋu knowledge about plant biodiversity in the Northern Territory of Australia might be shared in ways that reduce western ‘compartmentalizations’ of this knowledge. Within a classroom context, educators seek to provide students with opportunities for authentic engagement with broader communities while maintaining students’ autonomy and safety. Students should have the right to determine whether and how their work might be seen by wider audiences, and instructors need to be sensitive to the implications of using online platforms in a teaching context. Open pedagogy practitioners do not urge a single approach or solution to these tensions but instead view confronting them on an ongoing basis as a central responsibility for instructors in the twenty-first century. Visualizing Overlaps: Click on each plus-sign icon for a description of some projects at the intersections of each field. The square button on the top right will take you to a fullscreen view. To see this diagram in a static, text-based format, visit the Critical Orientation Appendix. Having outlined these motivating conversations about how audiences participate in scholarly communities, I’d like to return once more to my claim that strategic presentists should be devoting more attention to the present-day affordances of the long-nineteenth-century archive as such when they make a case for the broader relevance of our subdiscipline. This is an expansive stance, so let’s break it down into separate parts. 1) Like our own period, the long nineteenth century was a time of rapid technological and social change, and this led to a print culture “boom” that expanded the scope of the media and reading formations we are able to examine in our own work. Over the course of the nineteenth century, printed texts became much more affordable, prevalent, and accessible to people across a wider range of social classes than had been the case in past centuries. In Britain, literacy rates increased, railroads and the invention of the telegram changed the speed and frequency of communication, the concept of professional authorship gained traction, and new ways of cataloging and legally defining media began to crystallize. If in long-past eras, books were precious objects to be chained to library tables and limited to the elite, nineteenth-century books could be accessed through a library subscription at unprecedentedly low prices, purchased in penny installments, picked up in railway bookstalls, used as a vehicle for love-notes, or even torn up and used as kindling. Reading practices are always shaped by conventions that affect how people put texts to use. In the Victorian period, disparate interpretive strategies and institutions emerged as technologies expanded. A more widespread circulation of texts at multiple price points allowed readers to develop a more varied, personalized, and socially integrated range of interactions with literary texts. These rapid changes in print production, circulation, authorship, and reader interaction practices during the mid-nineteenth century mark what we would now call a period of “media in transition.” Participatory culture scholar Henry Jenkins defines this phenomenon as “a phase during which the social, cultural, economic, technological, legal, and political understandings of media readjust in the face of disruptive change” (Convergence 289). Such periods of readjustment often inspire writers to map out contrasting beliefs about the past and future of cultural institutions—what they were transitioning from and to. Because more people were empowered to read and write about such changes during the long nineteenth century, we have access to a wider range of perspectives to draw from in the printed matter that survives today. Preserved and digitized texts, as well as our own research processes, are inevitably biased toward dominant and privileged perspectives, but the sheer proliferation (and comparative democratization) of this media still gives us more artifacts to think with than we can access for many earlier periods. 2. Because the surviving 19th-century media archive is both massive and in the public domain, scholars can interact with our archive in a wider range of ways than it is possible for us to do with many other historical archives. Victorian texts occupy something of a sweet spot where preservation and accessibility are concerned. It is expensive to preserve physical media, and forces such as mold, fires, and people’s repurposing of written texts have caused a large number of texts to be lost to us. Many texts that have survived are prohibitively difficult to access or digitize. These challenges apply to many texts in the Victorian period, but thanks to the print boom, we are more likely to have multiple surviving copies of published texts to work from as we research. For example, if the sole existing copy of a 13th-century manuscript has a worm-eaten page, contemporary scholars must rely on context cues to fill the gaps. In contrast, if a grub devours a section of our copy of Dickens’s 1836 Pickwick Papers, we can look up multiple digital scans of the serial and volume publication of these tales. Added to this, many editions of novels published during and after an author’s life include different wordings, chapters, illustrations, or bowdlerizations; these are yet more interesting developments to think with. International copyright policies in the present day also make long-nineteenth-century media easier to access and analyze than is the case for many texts published in more recent years. Thanks again to the Victorian print boom, we have access to a large swath of published media from the period that falls within the protections of the public domain. While in the United States, the practice of re-using media for the purpose of teaching, commentary, scholarship, or creative transformation may be loosely protected under the terms of “fair use,” in practice, fair use is vaguely defined and poorly defended. In contrast, when a work is in the public domain, others have the legal right to republish, reuse, or modify it in any way they see fit, with or without attribution. In other words, people working with pre-1923 materials don’t have to worry as much about defending their use within a US system that interprets fair use on a case-by-case basis. This allows us to do innovative and experimental things with large numbers of texts, such as running thousands of novels through digital analysis applications and exploring the patterns that arise among them. Likewise, we can playfully modify nineteenth-century texts and printed images for a range of purposes—simple entertainment-value among them! The first image is a screenshot from a video essay that a Youtube creator named Breadsworld painstakingly put together to critique the Disney film Treasure Planet. Because Disney issued a takedown notice, the author had to remove their initial video and alter its contents. because the image appears in a scholarly essay and plays a purposeful role in this work. 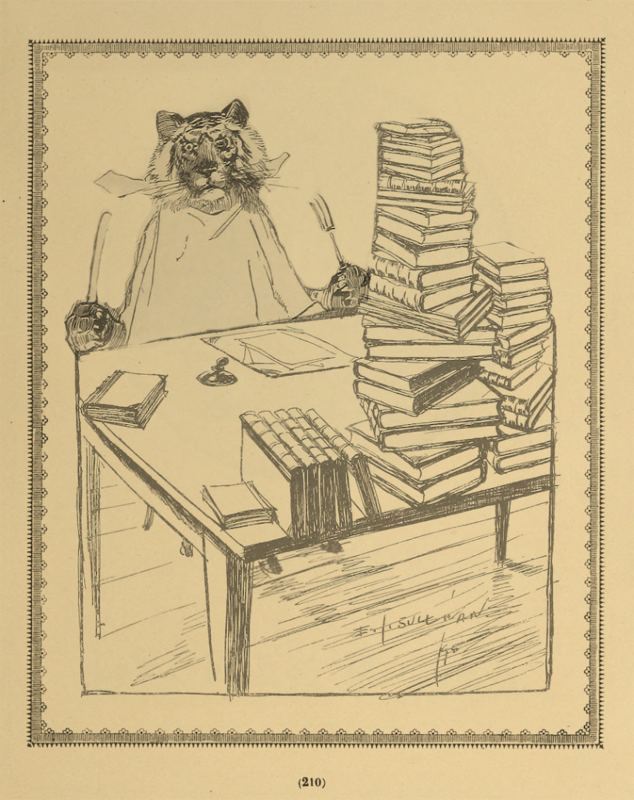 I could insist that the book-hungry tiger is a visual metaphor about Victorian readers’ voracious enthusiasm for texts. I could say that it’s a reference to corporations’ hunger for the profits to be gained from nineteenth-century media and current-day scholarly production alike. I could use it as a flippant description of my own research process, which sometimes produces intellectual appetites I don’t understand until they have run their course. Or I could simply say “I made it on a whim. It has no special significance for this project.” And while this might show questionable judgment, it would be legally unimpeachable. Admittedly, this image pairing does not convey a simple contrast between the license to adapt media and lack thereof: we can still raise multiple questions about privilege and differing interpretations of transformative use. (Would Disney’s representatives have felt as much license to send—or would this Youtube creator have felt able to formally protest—the takedown notice had Breadsworld been identified as a university-sanctioned scholar? Would the kinds of alteration at play in the collage cause the image to pass a fair use assessment more easily than Breadsworld’s use of the clip may have done?) However, even if we were dealing with two uses of the same media from—(film or collage)—I would likely only need to justify my use in the US when thinking about material published after 1923. My point is that the acknowledged public domain status of the images I used for my own adaptation requires me to expend less effort defending my use as fair use than would be the case if my archive were composed of more recent publications. Both Disney and I benefit from public domain permissions in this situation, as Disney’s Treasure Planet is itself a retelling of a Victorian novel: Robert Louis Stevenson’s Treasure Island. Far from paying royalties, Disney and I are not even required to give credit to the original authors or illustrators who produced our 19th-century texts. Yet Disney can attempt to police others’ commentaries about its recent work based on a US legal system that has more language and precedent for punishing copyright violators than protecting fair use (Mazzone xi). When working with artifacts in the public domain, Victorianists have opportunities for creative application and experimentation that would be more difficult to pursue if other players had copyright over their content. 3. A more-accessible archive expands opportunities for people who have limited material resources or institutional capital to participate in the field. In research contexts, the ability to work with materials depends on having the financial, institutional, political, and social capital to access and legally use that material in some form. For instance, not all scholars are able to obtain research funds to visit their primary sources in an archive or to pay permissions fees to reproduce media in their publications. And, as I’ve implied in my discussion of Breadsworld’s video, not all commentators are equally able to obtain the legal guidance about copyright or the institutional support that can help them make a formal case for their fair use should a concern arise. Corpora thus serve as aggregators of privilege within specific fields, elevating the voices of people best positioned to work with the most compelling artifacts. Specialty areas that present a more level playing field for access to the primary and secondary sources at the heart of their conversations have the potential to be more inclusive than others. The openness of our archive also has implications for those of us who teach with texts from the long nineteenth century: our students have opportunities to engage with materials that may not have come to the attention of a wider scholarly community. By pursuing this ‘original’ research, students are able to engage in authentic learning activities and see themselves as active contributors to the field. To be sure, there is nothing inauthentic about engaging with a well-trodden archive. As our theoretical conversations shift, so too do opportunities to think with long-studied texts in new ways: the field renews itself. However, when faced with the challenge to compose ‘original’ work about canonical resources, the weight of existing commentary can lead many students to feel as though the best that they can do is to retrace others’ footsteps. This is compounded by the fact that emerging scholars don’t always have the same level of familiarity with the discussions that have come before them as do long-time participants in the discussion. Even if a student pens an entirely new and productive reading of Middlemarch, their experience may feel the same to them as it would if they had interpreted the text in ways the field views to be deeply conventional. There’s still good reason to assign essays on Middlemarch, but there is a value for writers and facilitators alike in creating opportunities for students to explore ‘new’ territories as well. Here’s where we’re back in the world of open pedagogy. Consider how the conversation can change when we change the task and potential audience for a guided project in the humanities. Many courses in the present day culminate in what David Wiley refers to as a “disposable assignment”—a research paper or persuasive close reading that enters the Learning Management System and never leaves it, save perhaps for an evaluatory review by the instructor and (one hopes) a cursory glance by students once their grades have been posted (“What is Open Pedagogy?”) If instead, students work together to compose a resource that has a life outside of the classroom, the instructor becomes a facilitator whose goal is to support students in communicating their work rather than primarily taking on the role of post-composition assessor. If these students are working on a lesser-known portion of the archive, they face with a genuine need to do the kind of background research into their texts’ social contexts that will help their audience grasp their arguments. This serves as excellent practice for the work that many established scholars do in the discipline. It also gives students the opportunity to develop arguments about a text’s broader significance by synthesizing existing conversations in the field. And, if students are willing to share the products of their work openly, they can also view themselves as scholars who increase others’ ability to access Victorian Studies. 4. Our archive can help us see how contemporary media practices—expecially our scholarly and teaching practices—are taking on new meanings as technologies and institutions change around us. On its surface, the legal construct of the public domain is simpler than the legal construct of fair use. But as the long nineteenth century teaches us, when technologies change, new media affordances emerge and new communities form around these affordances. In turn, because these affordances and communities are commodifiable, new disputes emerge about who who has the right to use and profit from these media. Google Books preview page for a reprinted nineteenth-century tale. Click on the image for a magnified view or visit the media transcript appendix for a text version. This screenshot features a Google Books listing of Mary Elizabeth Braddon’s 1879 story “Shadow in the Corner.” In an unintended appeal to the few Braddon fans who happen to be ghost-whisperers, the seller claims that Braddon’s copyright is active as of 2016 and encourages readers to connect with the author to express their appreciation. While selling a text that is in the public domain is completely above-board, this publisher’s attempt to limit others’ rights to do the same with that text is not. This digital artifact is clearly the product of an ebook-on-demand industry that has grown so cheap and efficient that the accuracy of copyright pages isn’t of concern to the gatekeepers at Google Books. It is also possible that no deliberate falsehood was intended: the Braddon cover page may have auto-generated by a computer program, and this ebook may simply be too minor a piece in a larger collection of digitized texts for the producer to feel like customizing appropriately. Regardless of intention, however, it is striking to see such an ardent appeal to readers to respect copyright laws included in a text with a fraudulent claim and to think about the ways in which different audiences might respond. It is also striking to see this text indirectly authorized by Google, who may well get a small share of this text’s proceeds. But what does the sentence “Google requests that the images and OCR not be re-hosted, redistributed or used commercially” actually mean? Does Google think it is acceptable for me to re-host the images if I do so non-commercially, or is “used commercially” simply the last item in a list of prohibited acts? Textbooks are educational—can a commercial textbook feature a photo of Jane Eyre’s Google-watermarked cover page? Journals are scholarly, but they are also big business—would Google want Elsevier to profit from an article that features one of these image scans? Is it asking for a cut? More importantly, if this text is in the public domain and I’m writing in the United States, should I care what Google would prefer I—or my students—do with these scans? Is Google’s request even legally binding? One of the clearest precedents we have for questions like this is a 1999 U.S. ruling that reproductions that are intended to ‘faithfully’ depict an art object or text in the public domain are also in the public domain (Stokes 136). What does it mean for Victorian Studies if Google’s request is legally binding? Alternatively, what does it mean if it isn’t binding but we—or other scholars and students—believe that it is? Or if it isn’t binding but university representatives or publishers encourage us to leave the reproductions out of our work just to be on the safe side? Because so many nineteenth-century texts are in the public domain, questions about the worth of an author’s creative productions aren’t at the forefront of our decision-making about media reuse. Thus, we are better positioned to spot ambiguous rhetorical strategies like Google’s or attempts to redefine what a “faithful” reproduction means. If Barthes’ figurative “death of the author” helped to reshape the way we think about our methods, in today’s environment, the fact that our authors are literally dead can help us understand how larger institutions affect access to those authors’ texts. To torture another critical phrase, the medium is the message, but the mess left on our hands when we work with that medium is also the message. If scholars don’t pay attention to that mess now, our field’s ability to welcome a wider and more diverse range of participants into our conversations will suffer for it. This vigilance is the work of Victorian Studies too. Ablow, Rachel, ed. The Feeling of Reading: Affective Experience and Victorian Literature, U of Michigan P, 2010. Allen, Robert. “Perpetually Beginning until the End of the Fair: The Paratextual Poetics of Serialised Novels.” Neohelicon 37.1 (June 2010): 181–189. doi: 10.1007/s11059-010-0061-x. Bauder, Julia, and Catherine Rod. “Crossing Thresholds: Critical Information Literacy Pedagogy and the ACRL Framework,” College & Undergraduate Libraries, vol. 23, no. 3, 2016, pp. 252-264, DOI: 10.1080/10691316.2015.1025323. Bennett, Tony. “Texts, Readers, Reading Formations,” Bulletin of the Midwest Modern Language Association. 16:1, Spring 1983. Pg. 3-17. Bernstein, Susan David, and Catherine DeRose. “Reading Numbers by Numbers: Digital Studies and the Victorian Serial Novel.” Victorian Review, vol. 38, no. 2, 2012, pp. 43–68. JSTOR, www.jstor.org/stable/23646683. Bottando, Evelyn. “Hedging the Commons: Google Books, Libraries, and Open Access to Knowledge.” PhD (Doctor of Philosophy) thesis, University of Iowa, 2012. http://ir.uiowa.edu/etd/3265. Breadworld. 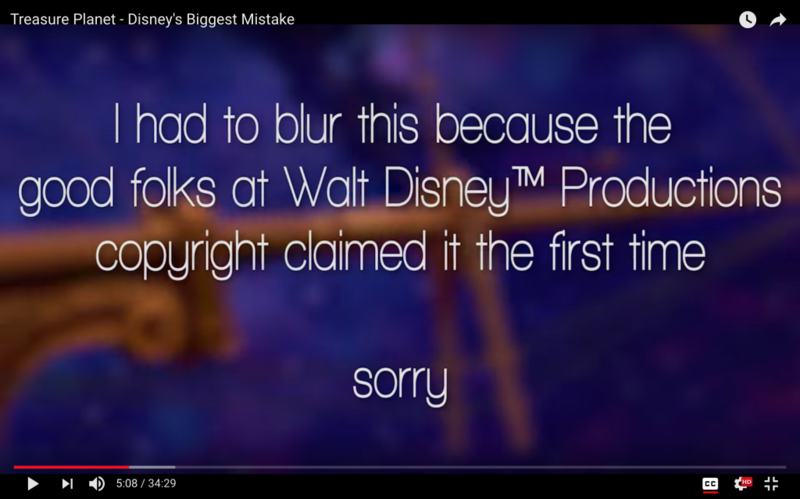 “Treasure Planet: Disney’s Biggest Mistake.” Youtube, 2017, 5:00, https://youtu.be/b9sycdSkngA?t=299. Cameron, Lauren. “Marginalia and Community in the Age of the Kindle: Popular Highlights in The Adventures of Sherlock Holmes.” Victorian Review, Vol. 38, No. 2, Fall 2012, http://www.jstor.org/stable/23646685, pp. 81-99. Accessed 22 March 2016. DeRosa, Robin, et al. The Open Anthology of Earlier American Literature. https://openamlit.pressbooks.com/. Felluga, Dino Franco. “BRANCHing Out: Victorian Studies and the Digital Humanities.” Critical Quarterly, vol. 55, no. 1, 2013, pp. 43-56. Finn, Kavita Mudan and Jessica McCall. “Exit, Pursued By a Fan: Shakespeare, Fandom, and the Lure of the Alternate Universe.” Critical Survey, vol. 28, no. 2, 2016, p. 27-38. doi: 10.3167/cs.2016.280204. Flint, Kate. “Traveling Readers.” The Feeling of Reading: Affective Experience and Victorian Literature, edited by Rachel Ablow. U of Michigan P, 2010, pp. 11-25. Fields, Erin, and Adair Harper. “Intersections of Open Pedagogy and Critical Information Literacy – A Case Study.” BCcampus, 27 November 2018, https://bccampus.ca/2018/11/27/intersections-of-open-pedagogy-and-critical-information-literacy-a-case-study/. Accessed 9 Feb. 2019. Permalink: https://perma.cc/U6XW-T53P. Funk, Johanna, Kathy Guthadjaka, and Gary Kong. “Posting Traditional Ecological Knowledge on Open Access Biodiversity Platforms: Implications for Learning Design.”The Australian Journal of Indigenous Education, vol. 44, no. 2, 2015, pp. 150–162., doi:10.1017/jie.2015.25. Gilliard, Chris, and Hugh Culik. “Digital Redlining, Access, and Privacy,” Common Sense Education, 24 May 2016, https://www.commonsense.org/education/privacy/blog/digital-redlining-access-privacy. Permalink: https://perma.cc/P2GG-SLF4. Gray, Jonathan, Cornel Sandvoss, and C. Lee Harrington. “Why Still Study Fans?” Fandom: Identities and Communities in a Mediated World, 2nd Ed. New York University Press, 2017. pp. 1-29. Gregory, Lua, and Shana Higgins. Information Literacy and Social Justice: Radical Professional Praxis, Library Juice Press, 2013. Griest, Guinevere L. Mudie’s Circulating Library and the Victorian Novel. Indiana U P, 1970. Jenkins, Henry. Confronting the Challenges of Participatory Culture: Media Education for the 21st Century. John D. and Catherine T. MacArthur Foundation, 2006, pp. 5-7, 19-20, 3-4. —. Convergence Culture: Where Old and New Media Collide. New York U P, 2006. Jhangiani, Rajiv. “Open Educational Practices in Service of the Sustainable Development Goals.” Open Con, United Nations Headquarters, New York, 2018. Recording and transcript: http://thatpsychprof.com/open-educational-practices-in-service-of-the-sustainable-development-goals/. Permalink. : https://perma.cc/9ENN-PEQE. Joshi, Priya. In Another Country: Colonialism, Culture, and the English Novel In India. New York, Columbia University Press, 2002. Kalir, Remi. “About the Marginal Syllabus,” http://marginalsyllab.us/about/. Retrieved 2 February 2018. Permalink: https://perma.cc/F3T9-2H6G. Ketabgian, Tamara. “Learning Through Victorian Garbage: Disgust and Desire in an Interdisciplinary Capstone Course,” in Teaching Victorian Literature in the Twenty-First Century, edited by J. Cadwallader and L.W. Mazzeno, Palgrave MacMillan, 2017, pp. 19-34, doi: 10.1007/978-3-319-58886-5_2. Kim, Beaumie. “Social Constructivism” Emerging Perspectives on Learning, Teaching, and Technology, ed. M. Orey, 2001, https://textbookequity.org/Textbooks/Orey_Emergin_Perspectives_Learning.pdf, pp. 55-61. McGill, Meredith L. “Copyright and Intellectual Property: The State of the Discipline.” Book History, vol. 16, no. 1, 2013, pp. 387–427. “More Information on Fair Use.” U.S. Copyright Office, updated December 2018, https://www.copyright.gov/fair-use/more-info.html. Accessed 9 Mar. 2019. Permalink: https://perma.cc/TSU5-KQZM. Muri, Allison. “The Technology and Future of the Book: What a Digital ‘Grub Street’ Can Tell Us About Communications, Commerce, and Creativity.” Producing the Eighteenth-Century Book: Writers and Publishers in England, 1650–1800, edited by Laura Runge and Pat Rogers, U of Delaware P, pp. 235–50. Robbins, Timothy. “Case Study: Expanding the Open Anthology of Earlier American Literature.” A Guide to Making Open Textbooks With Students, ed. Elizabeth May, 2017, https://press.rebus.community/makingopentextbookswithstudents/chapter/case-study-expanding-open-anthology-of-earlier-american-literature/. Permalink: https://perma.cc/5GHH-8HC8. –. “Guidelines: Section Introductions.” The Open Anthology of Earlier American Literature (Contribution Resources), Rebus Community, 2018. https://projects.rebus.community/project/499S8A8ksbk3tw3s75Yiow/open-anthology-of-earlier-american-literature. Robbins, Timothy, et al. The Open Anthology of Earlier American Literature, Rebus Community Press, 2019, https://press.rebus.community/openamlit/. Senier, Siobhan. “Indigenizing Wikipedia: Student Accountability to Native American Authors on the World’s Largest Encyclopedia,” in Web Writing: Why and How for Liberal Arts Teaching and Learning, ed. Jack Dougherty and Tennyson O’Donnell, University of Michigan Press/Trinity College ePress edition, 2014, http://epress.trincoll.edu/webwriting/chapter/senier. Permalink: https://perma.cc/A2UW-6ZYT. Steinlight, Emily. “Anti-Bleak House: Advertising and the Victorian Novel. ” Narrative 14.2 (2006): 132-162. Stokes, Simon. Art and Copyright. Oxford U P, 2001. Stommel, Jesse, and Sean Michael Morris. An Urgency of Teachers: the Work of Critical Digital Pedagogy. Hybrid Pedagogy Inc., 2018. Kindle Edition. Open-access edition: https://urgencyofteachers.com/. “Syllabus Bank.” V21 Collective, http://v21collective.org/syllabus-bank/. Accessed 10 January 2019. Permalink: https://perma.cc/L8FS-VH4N. Trettien, Whitney Anne. “A Deep History of Electronic Textuality: The Case of English Reprints of Jhon Milton Areopagitica.” Digital Humanities Quarterly vol. 7, no. 1, 2013, pp. 2-28. Vaidhyanathan, Siva. “Afterword: Critical Information Studies.” Cultural Studies, vol. 20 no. 2-3, 2006, pp. 292-315, doi: 10.1080/ 09502380500521091. —. Copyrights and Copywrongs: The Rise of Intellectual Property and How It Threatens Creativity, New York UP, 2001. —. The Googlization of Everything (And Why We Should Worry), U of California P, 2011. Wiley, David. “OER-Enabled Pedagogy.” Open Content, 2 May 2017, https://opencontent.org/blog/archives/5009. Permalink: https://perma.cc/RZ8V-K4LE. —. “What Is Open Pedagogy?”Open Content, 21 October 2013, https://opencontent.org/blog/archives/2975. Permalink: https://perma.cc/ZY3Q-CMYV. Wu, Jason S., and Joey J. Lee. “Climate Change Games as Tools for Education and Engagement.” Nature Climate Change, vol. 5, no. 5, May 2015, pp. 413–18. doi: 10.1038/nclimate2566. "Reading formations" are socially-situated practices for engaging with and interpreting texts. Or, as Andrew Bennett expands on the term: "Meaning is a transitive phenomenon. It is not a thing that texts can have, but is something that can only be produced, and always differently, within the reading formations that regulate the encounters between texts and reader" (Bennett 8). A group of scholars whose motto is "Victorian Studies for the 21st Century."